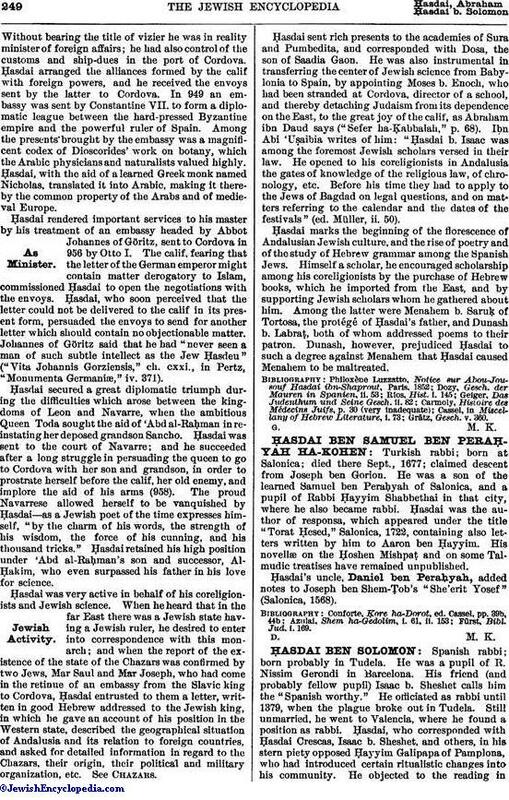 Turkish rabbi; born at Salonica; died there Sept., 1677; claimed descent from Joseph ben Gorion. He was a son of the learned Samuel ben Peraḥyah of Salonica, and a pupil of Rabbi Ḥayyim Shabbethai in that city, where he also became rabbi. Ḥasdai was the author of responsa, which appeared under the title "Torat Ḥesed," Salonica, 1722, containing also letters written by him to Aaron ben Ḥayyim. His novellæ on the Ḥoshen Mishpaṭ and on some Talmudic treatises have remained unpublished. Ḥasdai's uncle, Daniel ben Peraḥyah, added notes to Joseph ben Shem-Ṭob's "She'erit Yosef" (Salonica, 1568). Fürst, Bibl. Jud. i. 169.